Study design: Randomized double-blind investigation to evaluate the 25 OHD levels in elderly nursing home residents after 16 weeks when 800, 2 000 or 4 000 IU/day or 50 000 IU/week were given orally. Results: 25OHD serum levels augmented with increasing dose of vitamin D3. There was no difference observed administering 800 or 2000 IU/day. 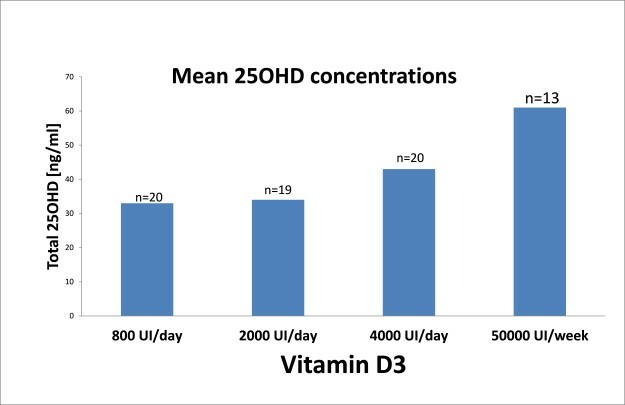 Conclusions: Concentrations of 25OHD increased linearly with 800 to 2 000 IU/day and 50 000 IU/week, suggesting a recommendation for some elderly adults to need more than 800 IU/day of vitamin D3 to achieve a sufficient vitamin D Level.